It was just a few days ago that I was talking to a friend I’d bumped into about Michael Jackson. We discussed his upcoming concerts, his weirdness and ended with a round of praise to his being able to release one ground-breaking album after another. He was truly an incredible artist. The next day, at the same exact time, his death was announced through Twitter. Think what you want, the man was a musical genius. He guided the music industry for decades, created the top selling album of all time and reigned supreme in the pop world as well as the music video industry. No one could make a music video like Michael Jackson. Each video told a story and going beyond 10 minutes for a video was totally acceptable. One of the most famous ones comes from his best selling album, Thriller. Michael Jackson died and the world exploded. We had not seen a reaction like this to the election of Barack Obama, the Iran election and subsequent protests or the deaths of Ed McMahon and Farah Fawcet (who died just hours before Jackson). In fact, the effect on cellphone towers and the Internet is said to be greater than even September 11, 2001. No site was safe. I tweeted at the time that I couldn’t access any news sites with merely a mention of Michael Jackson was inaccessible. No site was safe, not CNN, not Yahoo!, not even Google! All reported outages. AT&T said more text messages were sent that day than any other day in the history of text messaging on their networks. Twitter, once again the source for breaking news, was completely overwhelmed. Remarkably, the site was at around 90% stable, more than I’d ever expect out of the infamous fail whale. A search for Michael Jackson on Twitter’s search page loaded hundreds of new tweets ever few seconds. You could actually decipher what was going on simply by reading the Twitter Trends. 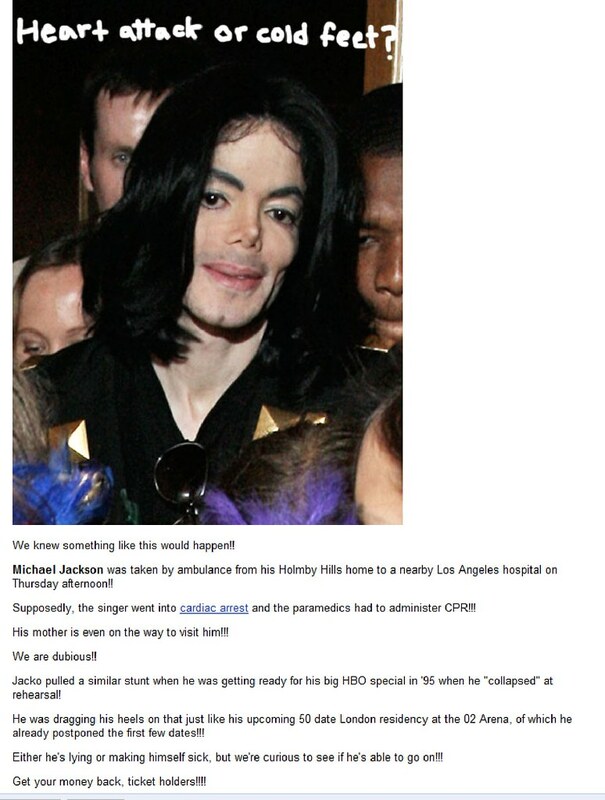 MTV was reporting live and showing tribute videos of Michael Jackson as he was rushed by ambulance to the hospital, with reports of a grim outlook. Today, a day later, iTunes was a fantastic sample of the impact Jackson’s death had on the world. His albums, singles and music videos dominated the iTunes Music Store charts, absolutely. But it wasn’t all positive. Perez Hilton continued to disgust with this post on his site, which I will not link to. Click the picture to open it up a bit bigger so you can read all that Perez Hilton wrote. This is what Perez originally wrote about Michael Jackson. Huge thanks to the twitter user than originally posted this image. I’d love to attribute it to him but TwitPic seems to have messed up, the user that actually posted it is not listed as that person today. Apparently over half a million hits and thousands of comments on a single picture in a single day outdid their servers. In the end, we’ve lost a legend and for that I am sad. But perhaps he’s somewhere better, where he doesn’t have to worry so much about his appearance. A place where his pain isn’t so great. We know he was a troubled man. Here’s to hoping that is all lifted. Let’s put our thoughts on his friends and family, especially his three young children. And let’s boycott Perez. Seriously. This entry was posted in Fabulous, Life, Music, Rant, Thoughts, Video and tagged Barack Obama, Death, Ed McMahon, Google, ITunes Store, Michael Jackson, Perez Hilton, Sad, Twitter, WTF?, Yahoo by Justin Scott. Bookmark the permalink.